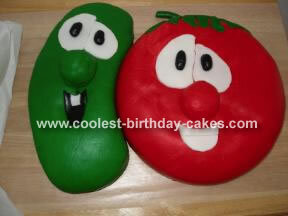 Larry the Cucumber was baked in a regular half sheet cake pan (vanilla). We then trimmed the edges with a knife until the desired cucumber shape was achieved. Bob the Tomato was baked in a round cake pan (chocolate, our favorite). We then put both cakes on a sheet of wax paper in preparation for the application of the fondant. We used a 5 pound box of regular white fondant that was purchased at Wal-Mart. It came in two two and a half pound blocks which we cut into 2 pound blocks.The hard part now was kneading and working the food coloring into the fondant. It was pretty time consuming. It was then rolled as flat and evenly as possible. The cakes were then covered in the rolled fondant and the edges were trimmed using an exacto knife. The remaining chunks of the white fondant were used to make the eyes and mouths. The noses were made from the excess cake that was trimmed from Larry and then covered in fondant. That’s pretty much it. We were pretty pleased with the end result of our Veggie Tale cake, being that it was our (my husband and I) first time experimenting with fondant (fun stuff!!). Samantha, our birthday girl, didn’t want to eat the cakes though, probably because she was traumatized from the severe beating that her Bob the Tomato received! Good job on these, they look great ! For a first time with fondant I’d say you did exceptionally well! Wow you guys did a really good job! I’m with anonymous, how do you make the fondant taste as good icing? This cake is AWESOME! I’m planning to make a “Bob” cake for my son’s birthday in a couple weeks and I hope it looks this good! It will be my first time doing a whole cake with fondant! I did a Bob & Larry cake with the marshmallow fondant icing. IT WAS WANDERFUL! The fondant was very easy to work with and it looked and tasted great!